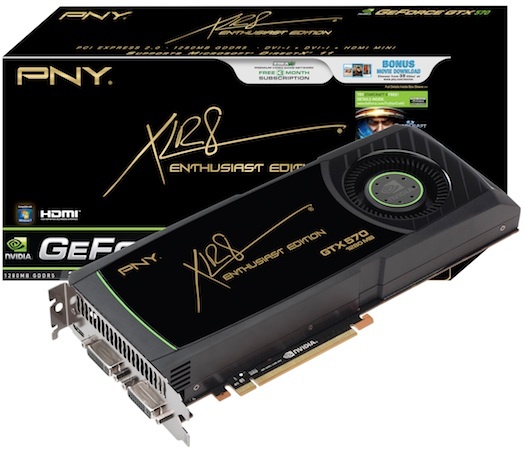 PNY today announced the XLR8 GeForce GTX 570 1280MB GDDR5 graphics card. PNY's XLR8 GeForce GTX 570 Enthusiast Edition offers incredible performance and stunning gaming effects. With cutting-edge Microsoft DirectX 11 technology and full support for all the premium GTX gaming technologies, such as NVIDIA Surround, 3D Vision, PhysX, and SLI, the GTX 570 screams performance. PNY's latest graphics card also features the new innovative thermal design for a quiet gaming experience. The GTX 570 delivers a fully immersive stereoscopic 3D experience, for the ultimate in PC gaming.